I have to say I am very impressed with this model another great bit of kit from Dapol. I have a Grey one to do also. Very nice. Generally speaking brown = vacuum or air braked (Usually vacuum in those days). Grey was unfitted. I'm not 100% if this also was the same with brakevans but I believe it was, so you may Ned a vacuum hose at either end of the brown version. Do a check first though just incase I'm wrong. I only suggest the idea as I know you love to get the little details in. You've done an amazing work yet again if it is you whose weathered them? 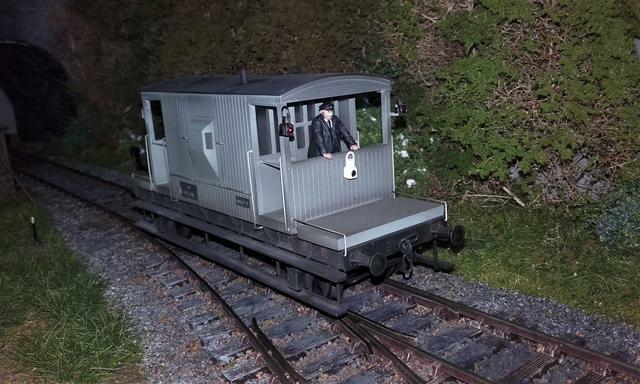 Working those brakevans can be petrifying! If one has a long stationary train of unfitted wagons... The loco starts off, and one by one the couplings grab and each wagon shoots forward. The effect is magnified alarmingly by the time it reaches the brakevan and whoosh, the acceleration is said to be more fearce then cars accelerating down a drag strip. The guard has to hold on or he will be off. Many guards were thrown off brakevans with this sudden force. I once tried it with just five wagons and a low speed and it was surprising. I watched the coupling raise and I was away! Brown livery (aka Bauxite) indicated not only 'air or vacuum brake' but vacuum or air 'piped' vehicles too. Most B.R. 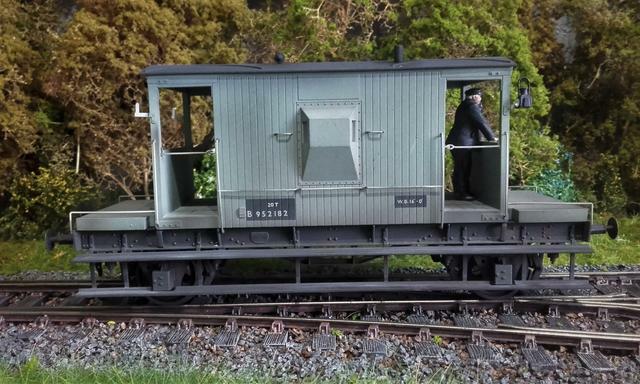 built brake vans were not given full vacuum or air brakes but quite a few had train pipes, and a brake gauge and setter (vacuum) or valve (air) for the guard to apply the brake on the train. The van had a hand brake of course but unlike the pre Nationalisation companies BR considered automatic brakes on the van itself unnecessary. These were painted brown. Many vans were built without any continuous brake gear, these were originally painted grey. Quite a lot then were retrospectively fitted, and they were re-painted brown. In their last years BR removed the vacuum pipes from some vans especially those transferred to engineer's train duties. 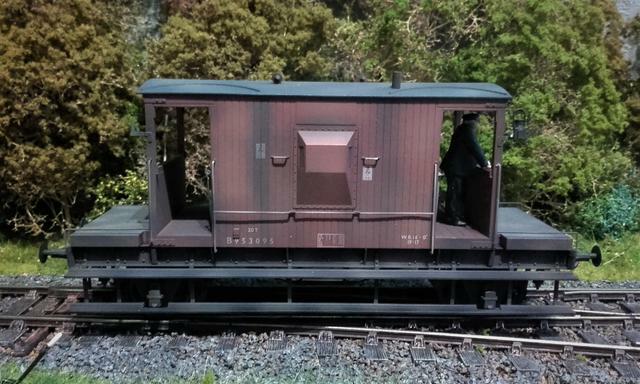 To help staff recognise these at a distance the end if the veranda was painted grey but otherwise they retained the brown livery. Thank you both for your comments and info, very interesting indeed. M.G. 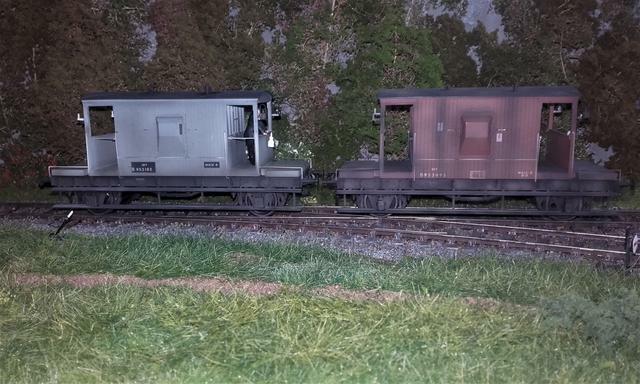 The Bauxite Van was weathered by Tower Models and the Grey one is by Grimy Times. Very very nice as always. 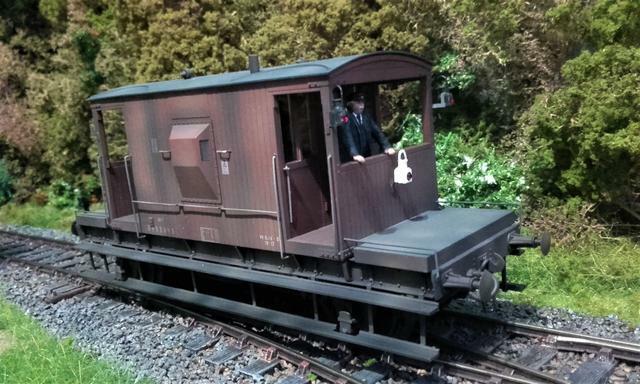 A very nice brake-van by Dapol and a lovely addition.